So here we go again. After another interesting regular season, the 2014 OHL playoffs will start off on Thursday, with a bevy of story-lines in store. In the East, the Oshawa Generals look to be the team to beat, but the North Bay Battalion have been strong as of late and might be a stern test for them. Plus, the Barrie Colts and Sudbury Wolves are going head-to-head in a series that you could easily see happening in the conference finals, let alone the first round. The opening set of series in the Western Conference should be straight forward, as all eyes are set on two insane second round affairs between Guelph/London and Sault Ste. Marie/Erie. However, anything can happen in the first round, so an upset might be in store that no one is expecting. But before we get to all of that, we have to say our goodbyes to the four teams that missed out on the playoffs, and also take a look at what lies ahead for those clubs. 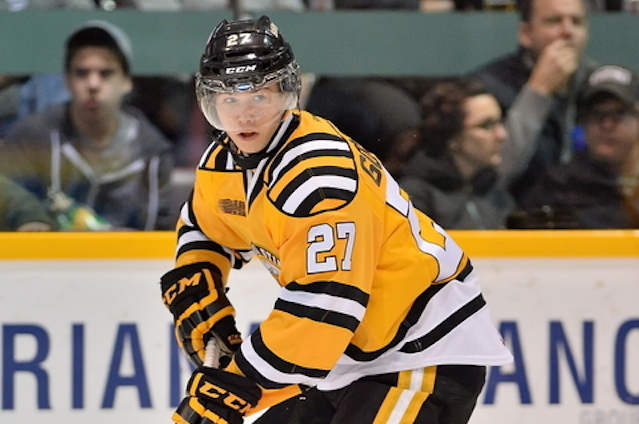 What I Predicted: When it comes down to it, this might be a long winter for fans in Sarnia, as the Sting seem set to return to the bottom of the league. What Actually Happened: Exactly that. Despite the scoring exploits of Nikolay Goldobin and Anthony DeAngelo, it wasn’t enough to keep the Sting out of the cellar. However, they did allow Soo Greyhounds forward Sergey Tolchinsky to score the goal of the season, so there is that. What Lies Ahead: Other than a change in team ownership, the Sting is currently preparing to make the first overall pick in April’s draft. It’s the fourth time that the team has had the top selection, having drafted Jeff Brown (1994), Steven Stamkos (2006) and Alex Galchenyuk (2010) previously. Toronto Junior Canadians defenceman Jakob Chychrun is widely considered to be the top overall selection, but don’t be surprised if they end up taking Vaughn Kings forward Adam Mascherin. What I Predicted: It seems like it might be a couple of years until the Rangers go back to the top of the mountain, but I have proven wrong by this team before. What Actually Happened: My first instinct was right. 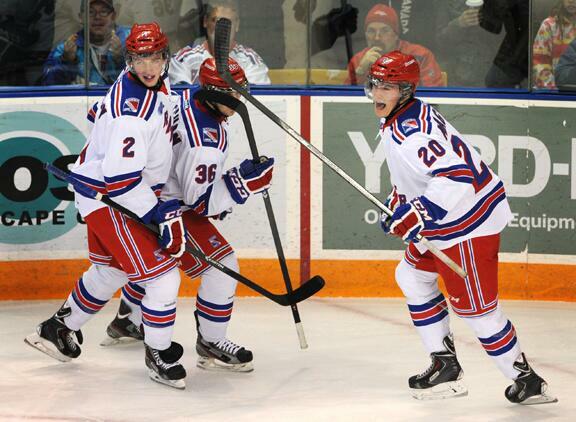 The Rangers found themselves fighting for scraps in a division where Guelph, Erie, and London ran roughshod, and the massive changes in the roster from last season proved too much to overcome. What Lies Ahead: There are some good pieces in the Rangers lineup, especially at forward, so I expect them to be in the playoff mix once again in 2014/15. The only question mark I have is the goaltending, and since no one can draft import netminders anymore (Thanks a lot David Branch), I am expecting Kitchener to take a long look at Michigan recruit Hayden Lavigne, whose rights they got at the deadline from Belleville. What I Predicted: There is a chance that this team could make the post-season again this season, despite finishing in the basement when things wrapped up last March. What Actually Happened: The 67’s had an opportunity to force a tiebreaker game against Mississauga if they were able to beat North Bay on the last day of the season, but were blown out of the building in a 12-1 loss to the Battalion instead. As a result of that defeat, the club will miss the playoffs in back-to-back seasons for the first time in its history. What Lies Ahead: A move back to the Ottawa Civic Centre (or whatever it’s called these days) is the biggest thing, along with having a second season out of Travis Konecny to build the offence around. Chris Byrne will probably be the most likely coach on the hot seat at the start of the campaign, so the key will be not to get off to a slow start. What I Predicted: I think the Bulls will be around the bottom of that six team logjam that will contend for the Eastern Conference crown, but given the fact that the East is such a mess right now, I wouldn’t be surprised if the Bulls sneak into the discussion for the East Division title. What Actually Happened: Well certainly not that. Despite a slow start, and trading away Brendan Gaunce to Erie, the Bulls still had a chance to sneak into the post-season before losing in overtime to Oshawa in it’s second last game of the season. Nevertheless, it was a quick drop-off from a team that was a win away from being in the finals a year earlier. What Lies Ahead: The biggest question is where exactly the Bulls will be playing in a few years time. The team’s lease at the Yardmen Arena runs out next season, and the debate is raging on whether the facility will be renovated or if a new arena will be built. With Chatham seemingly always coming up now in relocation rumours, it will be interesting to see what happens next with this team. 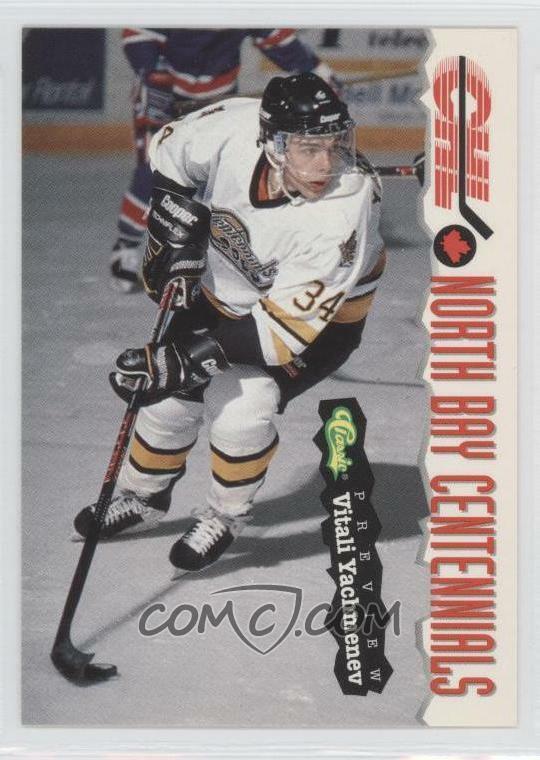 It has come to my attention from a number of well-placed and reliable sources, that this former North Bay Centennials legend is no longer playing in the league, thus rendering the 2014 OHL playoffs meaningless. Nevertheless, I suppose I should still go about making my soon-to-be wrong playoff picks here for the opening round of the post-season, since that’s what everyone is here for anyways. Anyways, that does it for now, or until the second round at least. Enjoy the playoffs kids, it should be a heck of a ride. 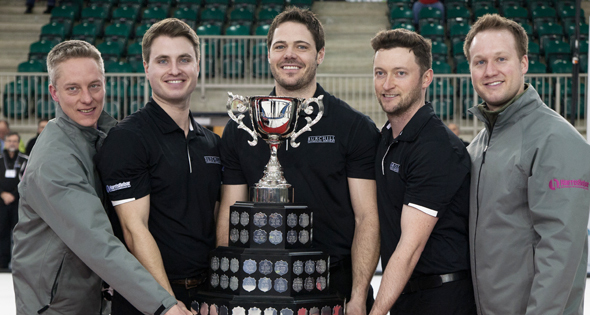 The 2014 edition of the Brier started off kind of bizarre, but eventually the cream rose to the top with the top three teams. However, we did have a bit of a surprise for fourth place as a team had a rekindling of some of their old magic from 2006. 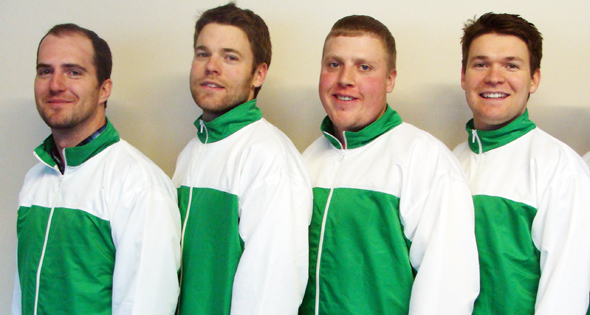 The 2010 Brier champions picked the best time to have their best game when it mattered the most. Although they had a bit of a slow start percentage wise, and they had two bad games in Draw 17 against Quebec and the 1 vs. 2 game against British Columbia, things turned around with an extra end semi-final win over Quebec and an excellent game in the final. 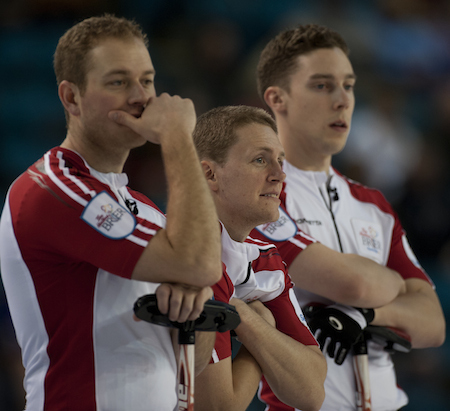 As a result of the win, they will become the first Team Canada in Brier history next year in Calgary. Where the heck was this performance during the Olympic Trials? 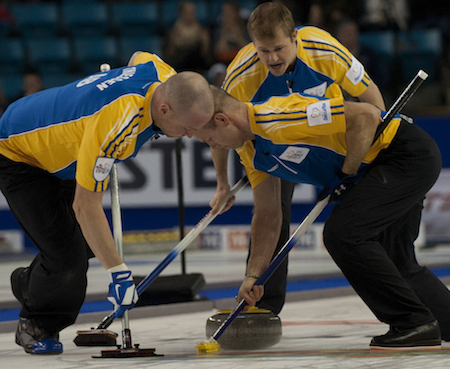 Nevertheless, Koe’s team was probably the best in the field all week, and it was nice to see them rewarded in the playoffs. Plus, it was cool to see Pat Simmons get his first Brier title, as the other three players had already won four years ago. Now John Morris and Jim Cotter know how Glenn Howard felt after losing both the Olympic Trials and Brier finals in the same year back in 2009. They were the best team percentage wise in the round-robin, and they had a spectacular showing in the 1 vs. 2 game against Alberta, but in the all-important final they came out flat. That was especially noticeable when they had the hammer as they only had singles while Alberta scored three points with the hammer on three occasions. Of course, now with all the potential team changes upcoming, it’s hard to tell if Johnny Mo will stay with this team. 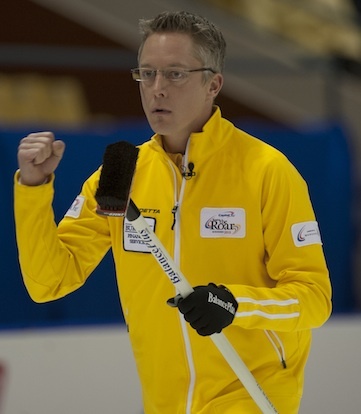 But if he does stay, they will break through and win a Brier. Like Brett said, the B.C. 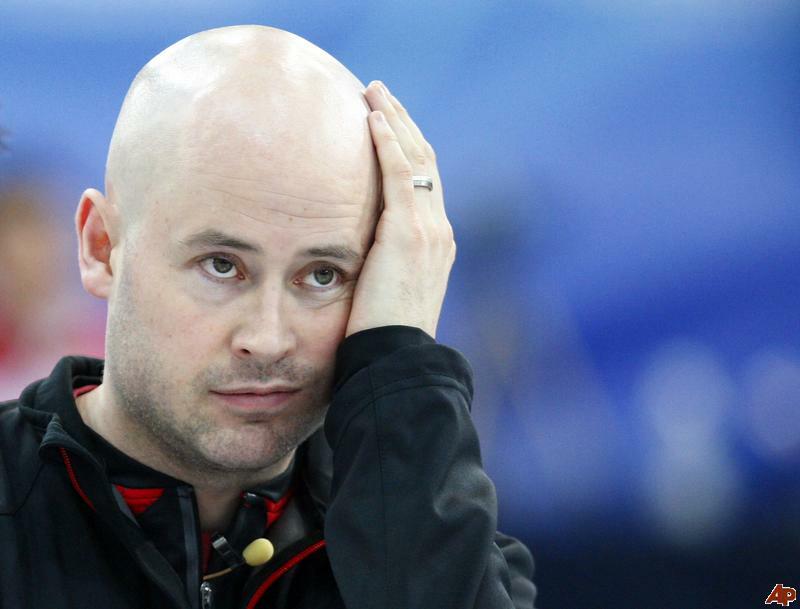 squad went flat at the worst possible moment, which is a huge shame as we haven’t had a close Brier final now since 2010 when Kevin Koe won in an extra-end over Glenn Howard. Again, with all of the off-season changes, who knows what happens with this team. 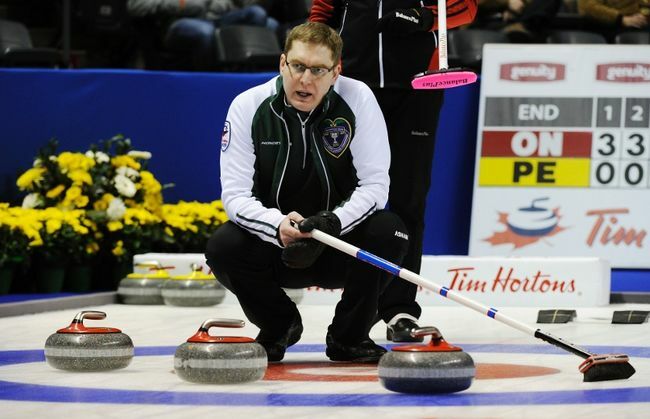 However, this year was Jim Cotter’s coming-out party on a national stage, and he deserves to be mentioned as a Brier contender in the future. 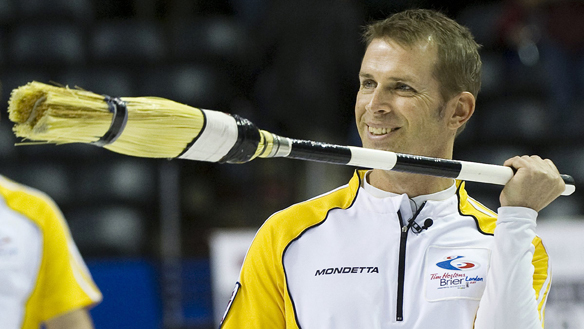 Yes, Jeff Stoughton is back on the podium once again at the Brier, but it was definitely an UnStoughton like week. Although they started off at 4-0, their numbers were not that great and they could have easily been 1-3. They did pickup their percentages during the week, it was not enough as a key miss in the 3 vs. 4 against Quebec took them out of contention, although they had an excellent showing in the bronze medal game. 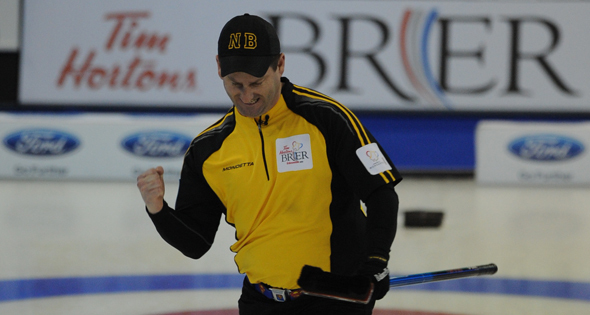 This might be Stoughton’s final Brier appearance, and if it is, he has had an incredible career. In what seemed awfully familiar to what happened at the Olympic Trials, it just seemed like the guys were off a little bit, as guys like Mead and Stoughton were missing shots that they would make with their eyes closed a couple of years ago. It’s hard to see Stoughton making another run at the Olympics, but it’s safe to say that no matter what happens, he will go down as one of the best skips in the history of the game. The 2006 champions broke a few speakers and maybe some glass with their yelling and screaming, but they showed off some of that ’06 magic once again, especially with a crucial win in Draw 17 over Alberta and a terrific 3 vs. 4 game victory over Manitoba. Unfortunately, they would come up one end short in the semi-final to Alberta and they would fall flat on their face in the bronze medal game to Manitoba. However, this squad looked like they would match Brad Jacobs feat of winning the Brier from the 3 vs. 4 game, which would have been a huge deal. Menard’s run was a surprise, especially as it was his first playoff run since his Brier victory, but I’m not sure if it was the biggest shocker of the week. Going into the week, Menard was our pick for fifth place, so I’m not that stunned that he did well. 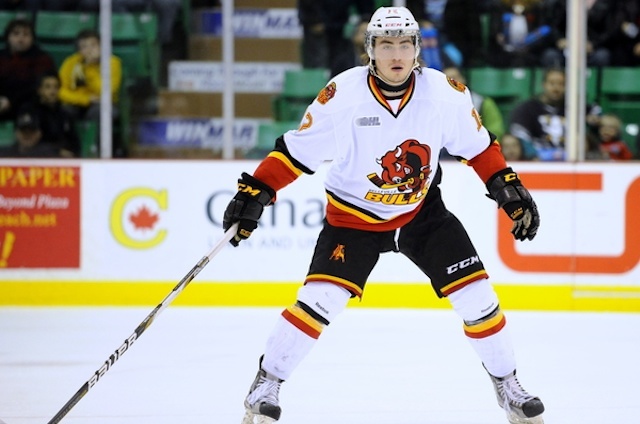 For me, the biggest surprise of the week was Eddie MacKenzie of Prince Edward Island. Okay yes the province got relegated because of the CCA’s three-year result format (which is no fun at all for me, as I was hoping a big province would stumble, or Brad Jacobs would be destroying Nunavut), but he won four games! I don’t think anyone saw that coming. This image of the team says it all. 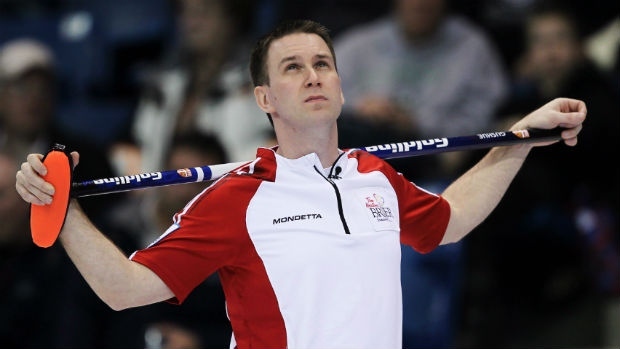 Coming into this week, we figured that this was Brad Gushue’s best ever shot at winning that elusive Brier crown since making the final in 2007, especially after his great showing last year. However, there seemed to be problems right from the start, as the front end of Geoff Walker and Adam Casey were struggling and Brett Gallant was the worst third of the week at one point. This forced Gushue to make hero shots once again, and led to me calling him the Eve Muirhead of men’s curling, as he had to make all kinds of tough shots to get out of trouble. 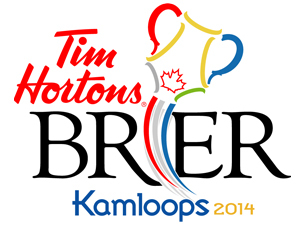 If you want to win a Brier, you can’t do that kind of thing that often. Hey, you take that back about Evelyn’s team. Anna Sloan is a heroine of justice. There is a valid point to Brett’s point about Gushue though, as he just had to make circus shot after circus shot just to keep his team in it. 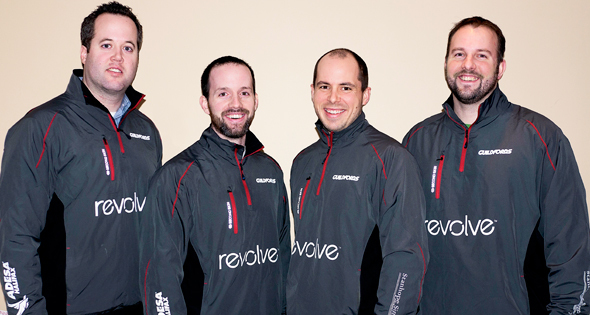 Given all of the changes ahead in the curling world, I would expect Gushue’s squad to be a trials threat in a few years time. But who knows after what happened in Kamloops. 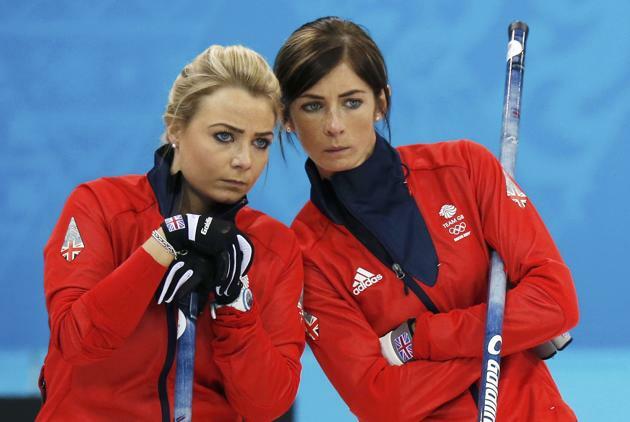 Before we start, I would like to give a personal congratulations to Jennifer Jones and Brad “COME ON!” Jacobs for their Olympic gold medal performances in Sochi. While Jones dominated and ran the table (which is a first in the Olympics on the women’s side), Jacobs did things the hard way as usual. He started off with a 1-2 record but turned up the intensity when it came to the playoffs as he destroyed both China and Great Britain by a combined score of 19-9. 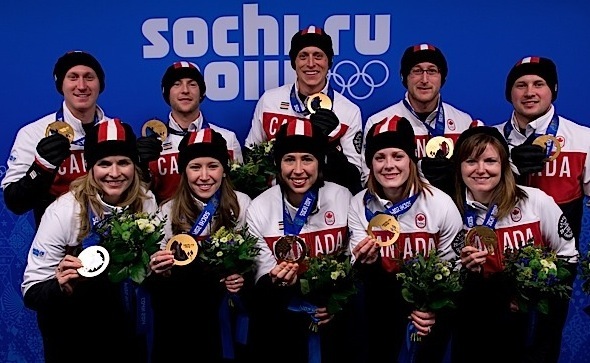 Now that the Olympics are over, its on to the Brier which has an extra added incentive this year as the winning team will return in 2015 as Team Canada, just like at the Scotties. 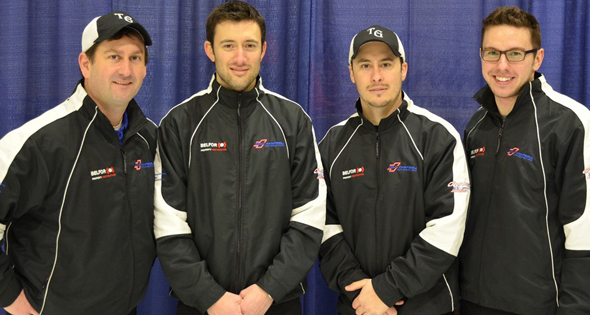 After a very disappointing showing at the Olympic Trials, the Stoughton crew decided to take their frustrations out on the field (and Mike McEwen, again) to win Manitoba. Ho hum right? Well that was about to change as an announcement came shortly afterwards that Nichols and Carruthers would swap positions at the Brier, which makes this team even deadlier with Nichols upweight ability being almost godlike compared to Carruthers. This will help Carruthers focus on draws more, which he is good at. Also, don’t forget about Mead and Stoughton and their runback ability. Speaking of disappointments, a lot of people thought this team from Calgary would be a potential dark-horse at the very worst for the Olympic Trials, but they struggled by going winless until their final two games. We’re still not sure how it happened as we know the potential of this lineup, but things just did not click. 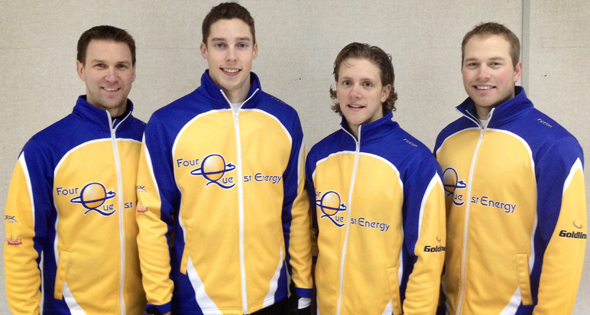 So after winning another tight provincial final over Kevin Martin (and potentially ending his career in the process) I see Koe’s true form returning with his deadly hitting ability shining through, which will again make this team a threat. 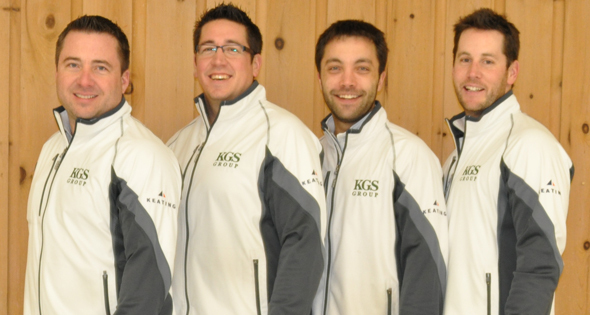 This team just missed out on making the Olympic Trials and they are also coming off of a great showing at last year’s Brier. 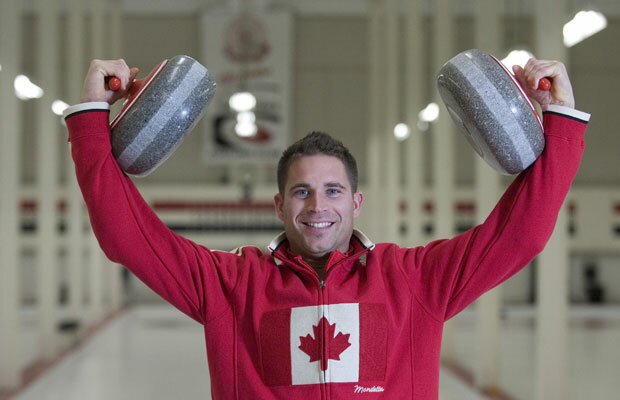 However, you have to wonder though if Brad Gushue is carrying this team on his back, as he made a boatload of hero shots at the Brier and the Pre-Trials just to keep his team in it. 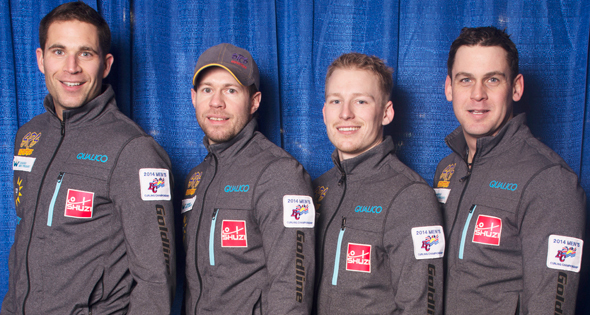 If the rest of the team can play well, then they could be a threat for Newfoundland’s first brier since Jack MacDuff won in 1976. 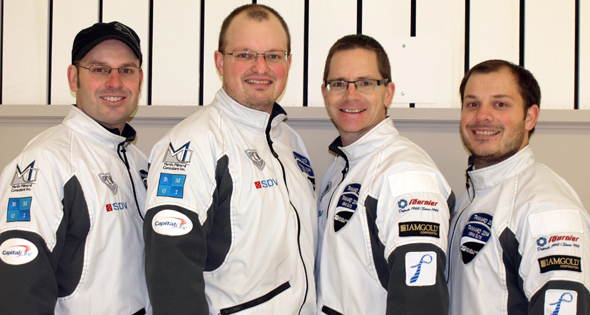 This team was the biggest surprise of the Olympic Trials in December as John Morris took the Cotter team all the way to the finals before losing to Brad Jacobs. Jim Cotter played fantastic during the trials and the provincials so the pressure could be more on Morris to make more shots as he can be hit or miss, especially with upweight hits. However, if he can do that, watch out for them to make another run to the title like they did at the Trials. Last year, Jean-Michel Menard came very close to making the playoffs, which was impressive considering how stacked the field was in Edmonton. Now granted, this field is a bit weaker than last year, but if he is gonna return to the playoffs, he’ll have to knock off one of the big four teams. That may not be an easy feat, however, with his experience it can be done. In 2011 Steve Laycock, who normally played third became the skip of a Saskatchewan team that included Pat Simmons. However it ended in disappointment as they finished 4-7. 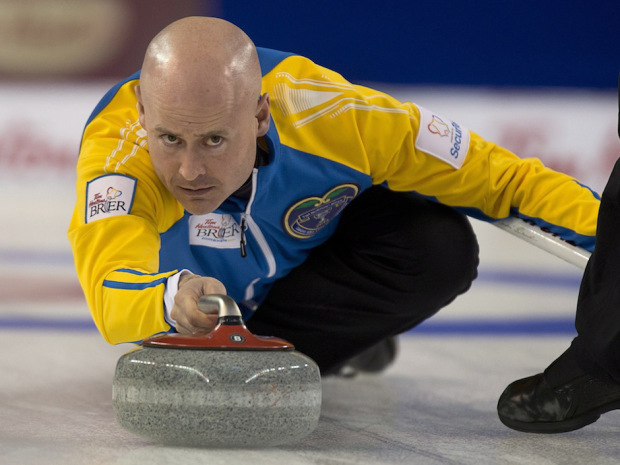 After Simmons left to join up with Kevin Koe, things kind of went downhill and Laycock struggled as a result. 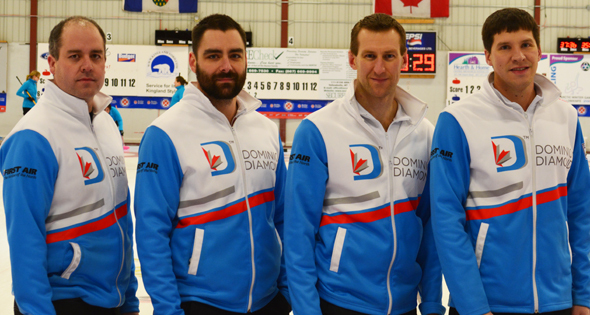 However things have looked on the up and up this year with a semi final appearance at the Pre-Trials and a return to the Brier, so this might be a team that you should not sleep on. Last year James Grattan looked like a potential playoff threat, especially after a giant upset over Kevin Martin, until he faded late in the going. He might be a bit of a long shot to makes the playoffs this year though, as he will ned to have no bad games at all and try to pull off one or two big upsets. Of note, alternate Steve Bice may also play in the second or lead role during the week, as the front end tends to switch around. All good things have to come to an end at some point and it happened this year in Ontario. 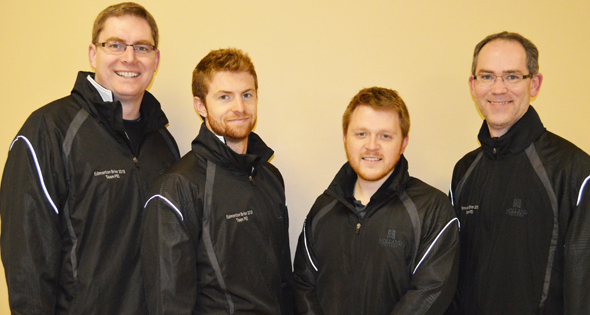 Greg Balsdon pulled off the upset of the provincials by defeating Glenn Howard and ushering in a new era in Ontario men’s curling after Howard had won eight straight provincial titles. Balsdon could be known as the Giant Killer from now as a result, as he also pulled a giant comeback in the Pre-Trials against Brad Jacobs, as he won 10-9 after being down 8-3 after six ends. So the big names may have to watch out for this team, which are the biggest wildcard in this entire field. 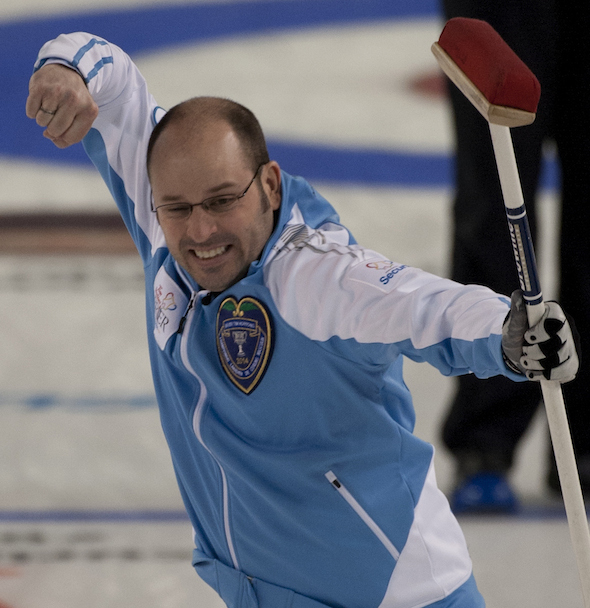 Two years ago Jamie Koe was the Cinderella story of the Brier by making it to the playoffs for the very first time for not only his team, but for the Territories as a whole. They ended up being 5-6 last year, but that was in a very stacked field that we have talked about before. Last year they were 5-6 but granted the field was stacked as mentioned before. 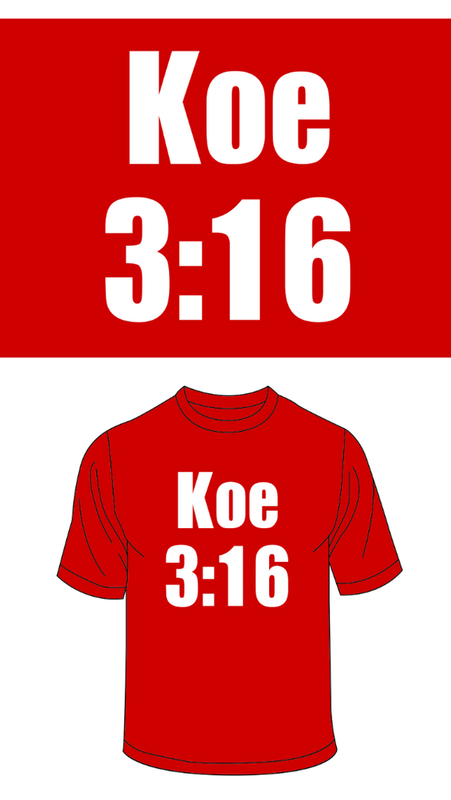 Now with a slightly changed lineup (Whitehead replaces Tom Naugler) and a weaker field, could Koe catch the magic of 2012? Perhaps, but the chances might be very slim. 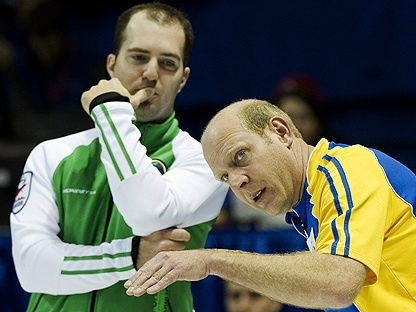 In 2012, Jamie Murphy upset Mark Dacey to make his first Brier appearance. Early on, he doing pretty well with a 4-3 record until losing four straight games to finish at 4-7. Since then, he has played in many World Curling Tour events, but I’m not sure if his record will improve that much from two years ago. 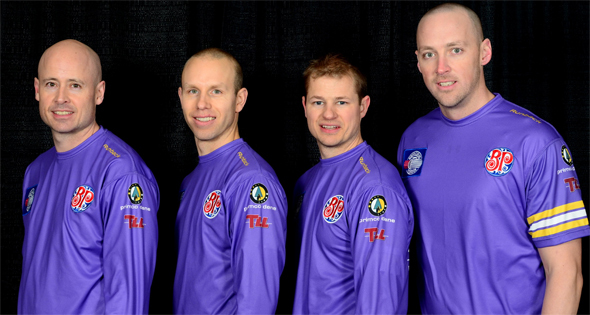 So without Brad Jacobs, we were going to have a new Northern Ontario team at the Brier. In the end, it turned out to be 1996 Canadian Junior Champion Jeff Currie, who does have a pretty decent lineup for this Northern Ontario squad. However this does show the issue with this Province and Newfoundland when it comes to the quality of the overall teams on a national stage, and I see nothing struggles for this squad, though he could pull off an upset or two. 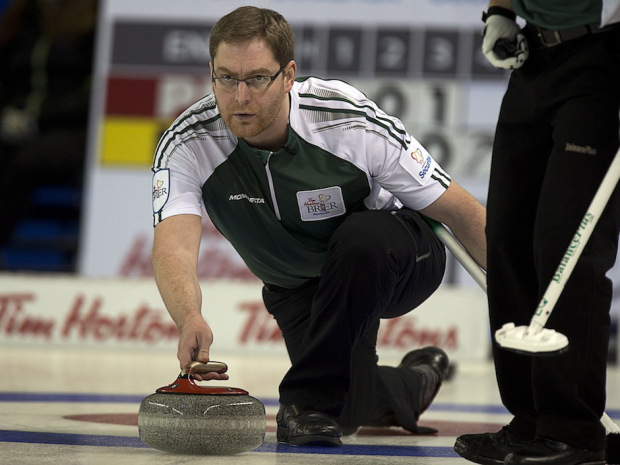 For the third time in the last four years, Eddie MacKenzie has returned to the Brier to represent Prince Edward Island, and he has made another change by bringing his son Tyler into the mix. However it could be another long tournament for him, as he tries to finish anywhere but last, which is where he his ended up in his previous trips to the Brier. 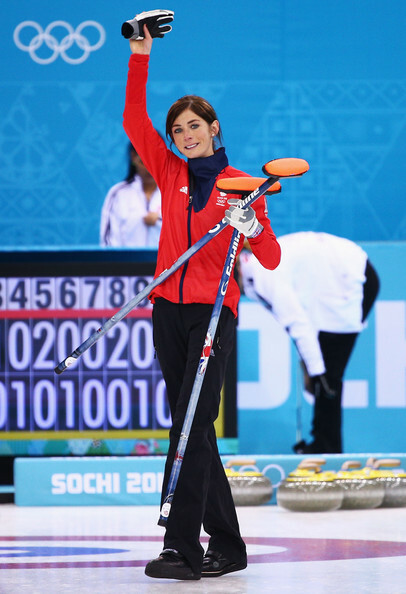 Whoa whoa whoa Brett, before we get started, we have to also salute Scottish curling heroine Eve Muirhead on her bronze medal at the Winter Olympics. Okay maybe that’s just me. As for the Brier field, you can probably divide into in three tiers once again. There’s a solid group of teams who can contend, and then another group of teams who are in the mid-level that might sneak into the playoff discussions, and your bottom feeders. Other than some blips at the 2012 provincials, last year’s Brier final to Brad Jacobs, and the Olympic Trials in Winnipeg, this team has been the best in the country over the last few years. It’s hard to say what happens after this season, but I expect this squad to get things done once again. I picked this team to win the Trials. I have no further comment on that great move. Anyways, like Brett said earlier, Koe’s squad should be a lot better at the Brier, especially since in his two previous trips for Alberta he finished in first and second place in 2010 and 2012 respectively. Since his 2007 runner-up finish to Glenn Howard in Hamilton, this is Gushue’s best shot at a Brier title. Given the way that he has made shots over the last year, I would be stunned if he doesn’t sneak into the semi-finals at the very worst. After an amazing run at the Olympic Trials, a lot more will be expected of this squad, especially since they are the host team. Cotter is no slouch though, and Johnny Mo is as solid as they come, so the playoffs should be in the cards. 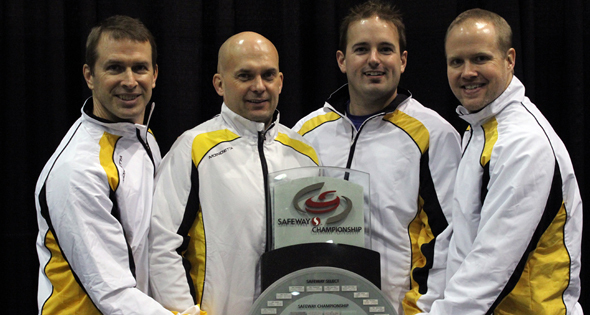 A Brier title won’t be too surprising either. 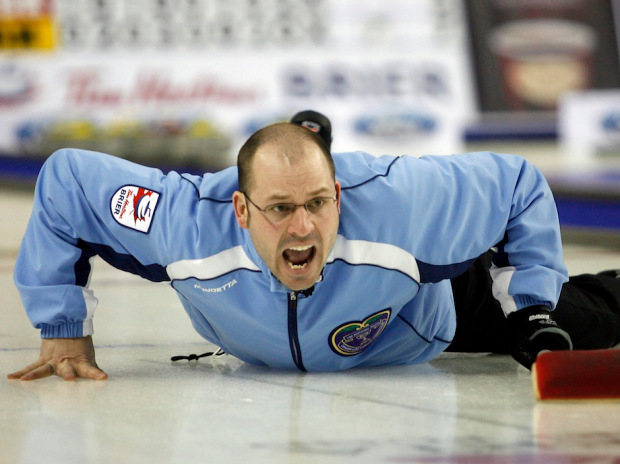 As Brett said earlier, the 2006 Brier champion has the stuff to make it to the playoffs. But if he doesn’t get a win over the top four teams coming into this week, he may have some problems. Since the bad boys of the prairies led by Brock Virtue didn’t return, a somewhat improved Laycock team is back for the land of the Green Riders. If he plays as well as he did at the Pre-Trials, Laycock could be a sleeper. However, if he struggles, it could be a long week. 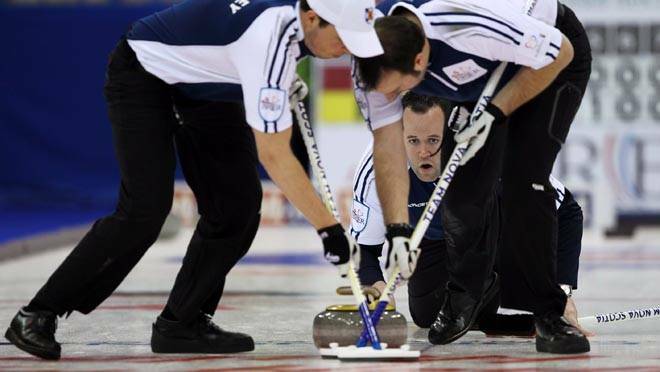 It will be weird to see someone other than Glenn Howard at the Brier for Ontario, but Balsdon is no slouch. I’m not sure he will make the playoffs in his first trip to the nationals, but this team will be in the mix all week as the biggest wild-cards in the event. First of all, let us discuss how great these shirts are that the team will be selling at the patch. I don’t expect them to have a 2012 playoff showing, but a 5-6 showing isn’t out of the question. 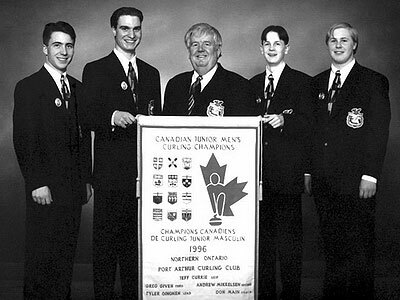 It’s been nearly 20 years since James’ big run at the 1997 Brier, so I don’t think he’s really a kid anymore. His quick start was a nice surprise last year, but I don’t expect that to happen again. Since Jacobs’ isn’t here, the former national junior champion (over Ryan Fry by the way) will have to prevent Northern Ontario from being in the relegation round next year. Though to be fair, Jacobs destroying Nunavut might be the most violent thing TSN has showed since WCW Monday Nitro. Poor Eddie. If he gets a win this week, I’ll be impressed.